The new horse at our barn was shown saddleseat and on the arab hunter circuit. I need to know what the normal aids are (especially for the canter) so that I can retrain him. Currently, we're struggling with the canter (okay, so today was his first ride here but still). He speed trots and lengthens when I ask for the canter MY way. If I chase him enough, he gets mad and canters but he doesn't seem to understand my aids. He's a baby, so it's possible he's not "finished" at the canter yet even at saddleseat. I just feel bad because he gets so flustered and confused when I ask him to canter. 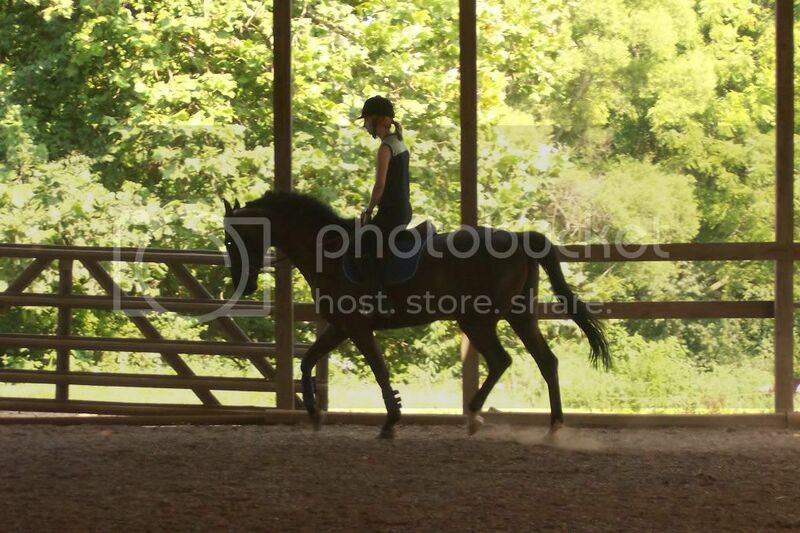 oh and his canter on the lunge is also...disasterous. If he's been shown, he's got to know how to canter. How young is he? Perhaps he's a bit out of shape and out of balance, maybe that's part of the problem? The saddleseat horses I rode, to ask for a canter, you had to have them very collected and then turned the horse towards the rail (tipped his head to the outside), pick up the outside rein and cue with the outside leg. He's definately shown. He just turned five...trainer said when she saw him go, they did an extreme outside bend and inside leg so I'm going to try that tomorrow. while doing this try to turn your body to take the weight of the horses lead leg. I'm not certain if any of this will help, but there are several things saddleseat/english trainers often do when cueing for the canter that may differ from your methods. The number one thing that you must remember is to keep your weight back. Sink into your seat, and step right down through your heel, keep your shoulders overtop your hips. Many trainers I've come across also weight the outside seatbone slightly heavier than the inside. As has been stated already, it's common practice to lightlybend the horse towards the outside. However, the correct way to do this is to shift only the hip to the inside - essentially a haunches in. From there, take up on the outside rein - often times it's a couple short half halts - slide your outside leg back, and cue. Some are trained off the inside leg, though that's a bit less common, as technically that's a counter canter command. You'll also want to concentrate on not throwing this guy away. These horses are usually trained to canter up into your hand; perhaps try and visualize almost pushing him him up and over the bit, asking him to jump up and into the transition. The last thing you may want to try is asking for the canter through a walk. I've followed some of your posts, and know that you're solid enough in dressage, and so out of all these suggestions, this one may sound the most backward of them all. However, in a saddleseat class horses are most usually asked to canter from the walk, giving the trainers a chance to 'walk them up into the bridle'. Therefore there's a strong possibility that your pretty little guy may go off better from the walk. Having ridden open dressage, as well as arab/NSH (Which is what your guy is, by the way - a saddlebred/arab cross is a National Show Horse) hunter, english and show hack, I've seen a pretty broad spectrum of cues. These to me are likely the most common cues used, as well as the most obvious ones you may be unaware of, or forgetting. I'll try that. Today was better. 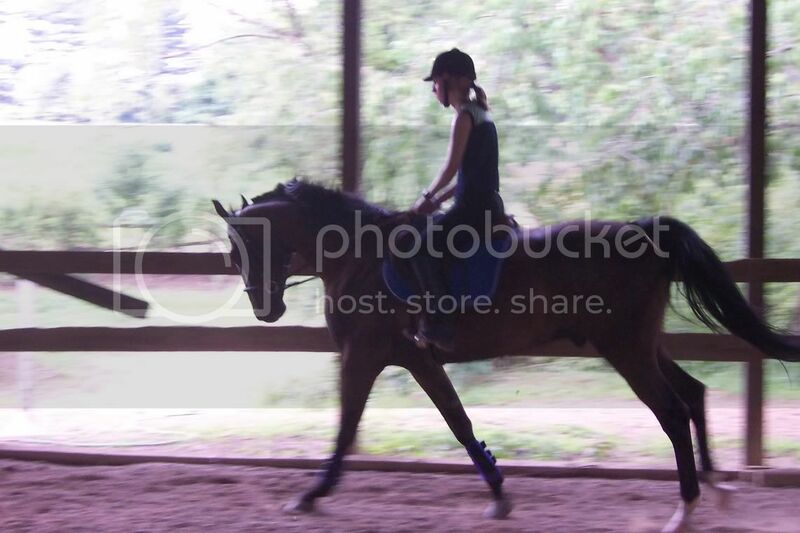 I half halted my outside rein and thought about lifting him up into my hand (this was before I read your post, but that's how I had to visualize it with my mare since she hated to be "dropped) and he ran only two strides before cantering quite nicely. I'll take your post to the barn tomorrow when I ride. I love riding him...he's a real blast! MrsMyrtleMay does the same thing as i do. actually at our barn thats what everybody does to cue into the correct lead. with the exception that we shidt our weight 2 the inside and shift our insde leg slightly forward. You are most welcome Make sure to update us on your progress! Why not? I thought any registered arab and resgistered saddlebred could qualify as a NSH. I know little about this, so am very willing to learn more. He's registered half arab and NSH. That's him in my first pics undersaddle of him. So thank you very much for your help!